A SpinZoneGlobal gift certificate is the perfect gift for anyone! Choose from one of several denominations and customize a gift for your special someone that they can use again and again until the full amount is spent. The shopping will be half of the fun of this gift! If you would like a plastic card mailed to the recipient, please put the ship to information in comments/send to. 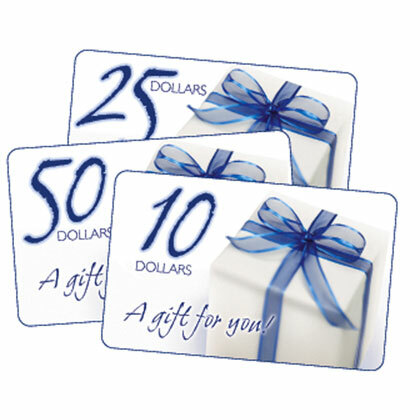 Gift Certificates must be redeemed toward the purchase of eligible products on SpinZoneGlobal.com. Purchases are deducted from the Gift Certificate balance. Any unused balance will be placed in the recipient's Gift Certificate account when redeemed. If an order exceeds the amount of the Gift Certificate, the balance must be paid with a credit card or other available payment method. 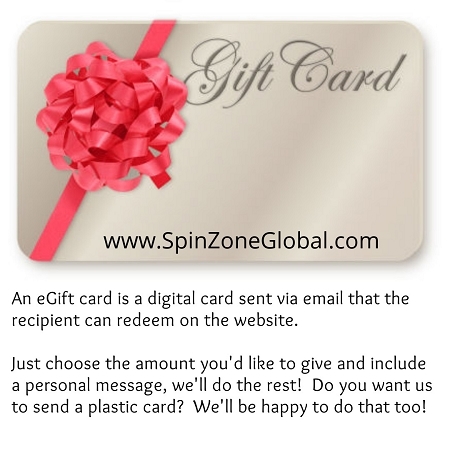 SpinZoneGlobal.com may provide Gift Certificate purchasers with information about the redemption status of any gift certificate purchased. o Cannot be used to purchase other gift certificates. o Cannot be reloaded, resold, transferred for value, redeemed for cash or applied to any other account. The risk of loss and title for Gift Certificates pass to the purchaser upon our electronic transmission to the purchaser. We are not responsible if lost, stolen, destroyed or used without your permission. SpinZoneGlobal.com will have the right to close customer accounts and bill alternative forms of payment if a fraudulently obtained Gift Certificate is redeemed and/or used to make purchases on SpinZoneGlobal.com. SpinZoneGlobal.com makes no warranties, expressed or implied with respect to gift cards. In the event a code is non-functional, your sole remedy and our sole liability (after verification), shall be the replacement of a code. Redeeming a Gift Certificate When a gift certificate is redeemed, the shopper will enter it in the store's coupon code field. This can be done in either the View Cart Page or during the checkout process. The store will then place the Gift Certificate's amount towards their final purchase. If a balance is left over, their certificate will still be good until the remaining amount is used up on subsequent orders.